(Hypebot) – Although Spotify is generally touted as being the front runner in streaming world with it's 51 million plus subscribers, new controversial data suggests that Apple Music may be on course to emerge the dominant player and, in some areas, may have even overtaken Spotify already. We keep reading about Spotify having more paid subscribers than just about any other service at 51 or so million, but it looks like Apple Music is not only catching up, but surpassing the service in many areas. 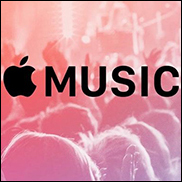 A new survey from the media measurement company Verto Analytics actually puts Apple Music at the top of the list for monthly unique users in March, with Spotify coming in third behind Pandora. The study looked at adults over 18 only in the United States. Apple Music is now reported to have 32 million subscribers, which is a huge jump up from the 20 million that was reported only at the beginning of the year. What’s more, it boasts almost 41 million unique monthly users in the US in March, which topped all other streaming services. What was interesting is that the top stickiness (the time spent on a listening session) went to Spotify at 25%, while it also topped out the monthly sessions per user at 51. Amazon Music came in at a strong 22% stickiness for second place, followed by Pandora at 21% and Apple Music at 19%. Interestingly enough, Tidal was nowhere to be found among the leaders of this chart, despite having more publicity than just about any company not named Spotify. What this shows is that while Spotify may have the worldwide lead in subscriptions, Apple is catching up fast, and Amazon Music may be even faster (with a reported 65 million subscribers thanks to its Prime service and Echo speakers). The disadvantage for Spotify is that its up against some deep pockets in Apple, Amazon and even Google (which came in at #9 on the chart below). These companies aren’t that concerned with making money from music as it’s not their core business, which makes them very difficult to compete against over the long haul. The prediction here is that by the end of the year Apple Music and Spotify will be about equal in paid subscribers, but look for Apple to take the lead next year after Spotify goes public and its investors cash out.